The principal of the La Loche, Sask., high school marking the anniversary of a mass shooting this month met with Prime Minister Justin Trudeau to remind him of the help he promised when he visited the community a year ago. The principal of the La Loche, Sask., high school about to mark the anniversary of a mass shooting met with Prime Minister Justin Trudeau on Friday to remind him of the help he promised when visiting the community a year ago. 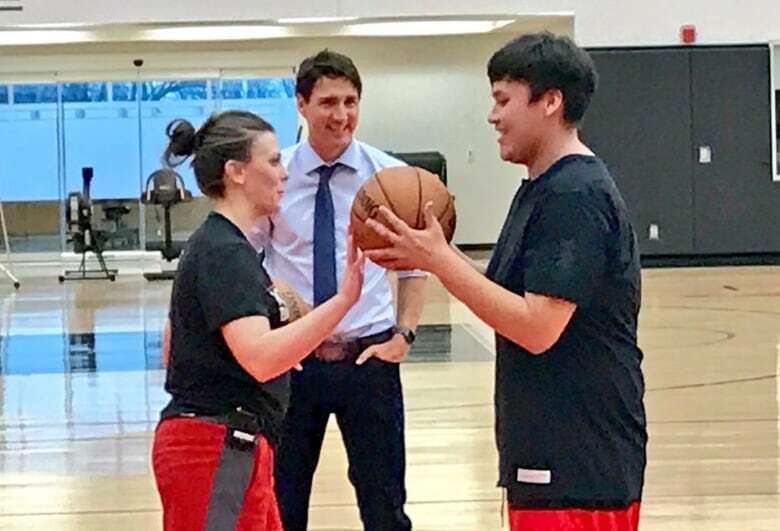 Trudeau spoke with Greg Hatch in Toronto, along with 10 students from the Dene high school campus who had been invited by the Raptors to visit. And earlier this week, Hatch and other leaders in the northern Saskatchewan community blasted the federal and provincial governments for failing to provide enough social services. A 17-year-old has been charged in the deaths of four people on Jan. 22, 2016 — and leaders, at the time, underscored a sense of hopelessness and isolation within the community of 2,600. "What I was talking about ... is the big stuff, the systems," Hatch said Friday. "The systems and the areas within the big systems ... What is the plan? What is the plan?" He put the same question to Trudeau, he said, but the prime minister didn't speak to reporters after the meeting. Hatch said he's hopeful his words, and those of the children, resonated with the prime minister. "We talked today [but] we need a plan," Hatch said of the conversation. "He understands [the need]. He's been in our community, so he understands." When the prime minister visited the community in January 2016, its acting mayor asked both Trudeau and Saskatchewan Premier Brad Wall to commit to a 10-year community development fund for La Loche. While Trudeau did not directly respond to that request or to questions about it at the time, he said that the federal government would be there for the "extraordinarily resilient community." We have to figure out a way to give them some passion for life. - Masai Ujiri, Raptors general manager on La Loche, Sask. "We will and we must work together to address the deeper issues facing our country that has yet again been highlighted by tragedy and heartbreak one week ago," he said at the time. ​But it was Raptors general manager Masai Ujiri who responded recently, because he said he saw the community needed help. He said he saw similarities between villages in his native Nigeria and in La Loche when he toured the community late last year. The NBA team's general manager runs an outreach program for youth in his homeland. He wanted to provide the La Loche students with something similar. "I feel we have to figure out a way to give them some passion for life," he said. "And maybe find a platform to talk about some of the history and how we can make it better." While in Toronto, the students toured Ryerson University, met Trudeau, and worked out with Raptors coach Dwane Casey at the team's training facility. On Friday night, they got to see the Raps take on the Brooklyn Nets. Ujiri, however, said he understands taking the students outside of La Loche for a weekend won't fix all the community's problems. "We have to make La Loche better," he said. "And ... one of the reasons I did this is for these kids to see that they can come back [from tragedy]. It's not always asking for help. It's also about taking responsibility; so [now] they can take responsibility when they go back." High school student Jerimiah Janvier-Mercredi wants the country, however, to know that it also has a responsibility to his home and the people living there. He said he knows his parents are proud of him for travelling to Toronto, for speaking to the media and for speaking frankly to the prime minister. "I want Canada to know that we don't want to be forgotten," Jerimiah said. "And that's basically all I want to say."